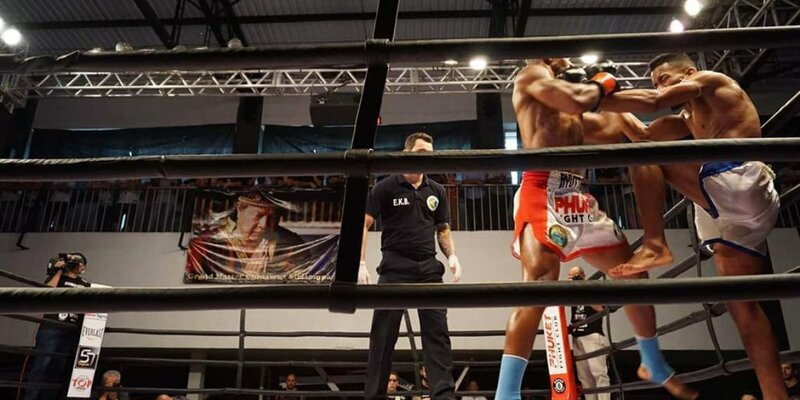 The Super 8 Muaythai Professional had its first edition on Brazilian soil on August 26 in the city of Campinas, state of São Paulo. 8 of the best national competitors in the -67 kg category were handpicked to make the show complete. With sound and lighting structure to envy the great international events of the sport and with live broadcast by the Combat / Sportv channel of Globosat transmit to 134 countrys , he awarded the great champion of the night, after 3 great fights with a beautiful belt brought from Thailand, 5 thousand reais , the hand-crafted Super 8 champion silver ring and 30-day practice session in Phuket. The Super 8 Muaythai Professional is a WMO (World Muaythai Organization) event, and is chaired by Arjarn Fabiano Kruschewsky, leader of MTB (Muaythai Boran Brazil). Arjarn Fabiano is Brazilian but resides in Portugal for many years, and although he does not live in muaythai, he lives in Muaythai. Already at the weigh-in the day before the weather was tense because only there would be known who would fight against whom. After a numerical draw, the fighters would choose their place in the key, avoiding any possible confrontation, or seeking the same, as was the case and Lincoln Buakaw (Omnoi), who on his turn went straight to the side of Thiago Bom (Thai Center) , closing the first fight of the eliminatory ones. The fighters of the Super 8 Muaythai Professional GP were: Thiago Bom (Thai Center); Lincoln Buakaw (Omnoi Gym); Julio Maximus (013 Muaythai); Jonathan Ferreira (Coliseum Team Academy); Bruce of the Saints (Bruce Team Muaythai); Arnaldo “Moska” Johnson (AFC); Samuel Brito (Dragon Academy); Victor Hugo (Art Fighters). 1st fight: Thiago Bom vs. Lincoln “Buakaw” (Thiago won by points) 2nd Fight: Julio Maximus vs. Bruce dos Santos (Julio won by points) 3rd Fight: Arnaldo “Moska” x Samuel Brito (Arnaldo won by TKO) 4th Fight: Jonathan Ferreira vs. Victor Hugo (Jonathan won by points) Semi-finals Julio Maximus vs. Thiago Bom (Maximus won by points) Jonathan Ferreira Arnaldo “Moska” (Jonathan won by points) End Jonathan Ferreira vs. Julio Maximus – Jonathan won by stitching himself as the great champion of the Super 8 Muaythai Pro, writing his name among the best -67 kg in Brazil. The Super 8 Muaythai Pro was already born as Muaythai’s biggest event in Brazil, for its production, fighters, awards never before offered in a single event. WMO Brazil.